Is your music on the Google cloud? Google Music has released their official iPhone optimized website. Note that a couple of native Google Music iPhone apps have been released in the App Store for Google Music, so be sure to read about those as well. The Google Music Manager app syncs all your music and playlists with Google Music which is great and you have access to all your tracks and playlists on the iPhone over the cloud. To get to it, just go to music.google.com from Safari on your iPhone or iPod touch, and you’ll find the Music Beta by Google interface after you login to your Google account. 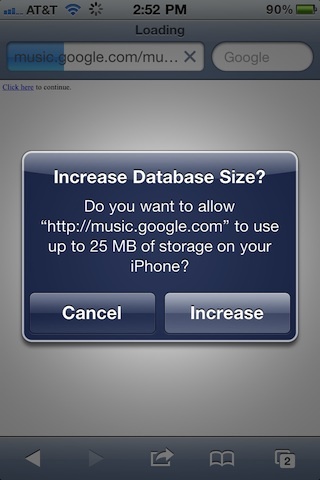 The first time you load the page, you’ll be asked to allow Google music to use 25MB of storage on your iPhone by increasing the database size allowed for websites. Just agree by tapping the Increase button and you’re set. This allows Google Music to store your library data and preload streams onto your iPhone so that playback is not interrupted. The webapp has a dark blue interface. There are sliding navigation tabs across the top for switching between Artists, Albums, Songs, Playlists, and Genres. You can also tap the letters on the right side to jump to a section. Tap the search icon and find anything by keyword. There is a small menu button to sign out or see the Desktop site for Google Music. Also you can create a shortcut icon on your iPhone Home Screen for Google Music by tapping the Bookmark icon in Safari and choosing Add to Home Screen. You can swipe up or down to navigate your music collection, although scrolling feels a tiny bit jittery due to this being non-native app. This issue become more evident if you have a really large library. Also sometimes I noticed that you accidentally end up tapping on something when trying to scroll and vice versa. However the responsiveness of flipping through items is quite fast since the info is cached locally. Once you pick a song Google Music starts to preload it and after a few seconds the play button appears. Tap that to start listening. There are all the basic playback features you would expect in the Now Playing screen including a seek bar, shuffle, repeat, pause, play, next, previous and album artwork support. 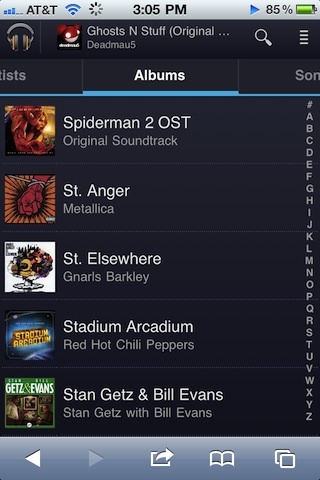 You can jump back to your library and browse around while listening to music. Plus while you’re in playback mode, there is a nice little info window on top at all times so you know what’s currently playing with the album art, artist and track name. The currently playing track is also denoted in your playlists by an animated icon next to it. If your iPhone goes into Auto Lock mode or if you lock it yourself manually, the track continues to play in the background and when one song is done playing the next one in the queue automatically starts to play. You can even close Safari and use other apps while listening and multitasking. Now here’s where it gets tricky. If you close Safari and open up another app, playback will stop once the currently playing song ends. But if you keep Safari open, even if your iPhone locks, playback goes on uninterrupted. So, don’t close Safari if you’re listing with headphones. Offline playback is not perfect while in Airplane mode on your iPhone. When you go offline, the currently playing track will play but that’s it. You can still navigate your entire music library as long as the website is already loaded, but you can’t listen to anything. There is even some support for the native iPod controls with this webapp. During our tests the next and previous buttons did not load the tracks, but the pause and play buttons worked. Another limitation is that you can’t manage anything from the iOS interface meaning you can’t add tracks, delete tracks, create playlists. The Google Music webapp is definitely a good beta release by Google for its iPhone users. While not perfect it’s a good way to stream your music from anywhere as long as you have a network connection. 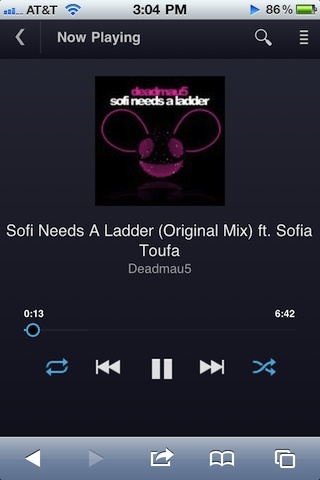 The Google Music iPhone web app is a great combination to have on your iPhone to complement the Spotify app. Worth bookmarking in Mobile Safari. AppSafari review of Google Music iPhone app (web) was written by Joe Seifi on September 10th, 2011 and categorized under Free, Music. Page viewed 6616 times, 1 so far today. Need help on using these apps? Please read the Help Page. Unless there’s something I’m missing, how do you create a music-playing app with no volume-control?